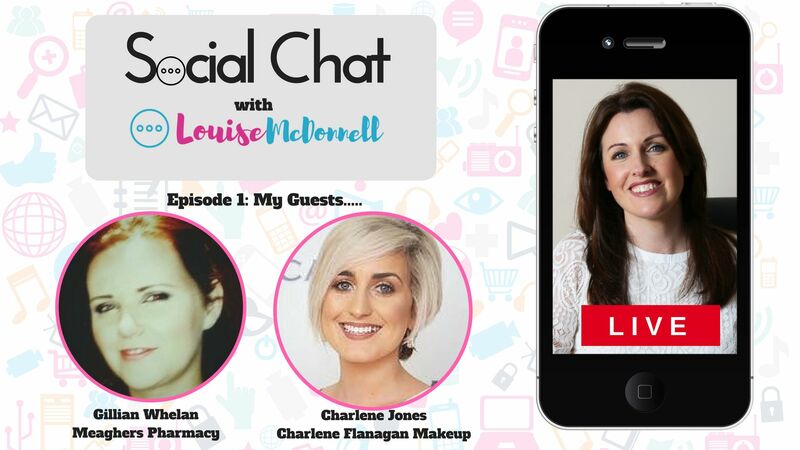 I really enjoyed my Facebook LIVE chat with Charlene Jones from Charlene Flanagan Makeup and Gillian Whelan from Meaghers Pharmacy. Between them, these two brands have a social media following of 100,000 followers. During my show I investigate how they grew their fan-base. 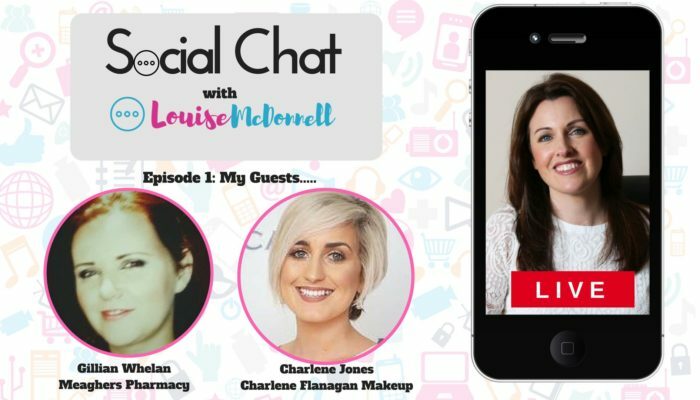 Welcome to Social Chat with Louise! Tonight my guests are Charlene from Charlene Flanagan Makeup and Gillian Whelan from Meaghers Pharmacy! Find out how these two brand grew their following on Social Media! I've also got the latest figures on social media usage in Ireland…stay tuned!! Please like, comment and enjoy! Here are some of the screen shots Charlene and Gillian share during the show. In the slide below, Charlene shows how a “before and after” image performs on her page. With an organic reach of almost 100% this post had a reach (was seen by) of 20,920. 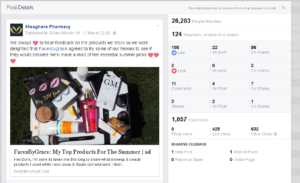 Engagement levels were high with 423 reactions, comments and shares and 1900 post clicks. 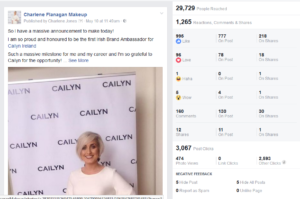 When Charlene announced on her Facebook Page that she had become a brand ambassador for Cailyn Cosmetics her fans showed their delight by engaging with this post! 1,262 reactions, comments and shares and 3,067 post clicks led to an organic reach of 29,729. 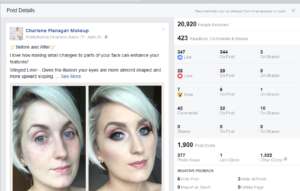 Gillian shared a post featuring a blog article by the beauty, fashion and lifestyle vlogger, FacesByGrace featuring her top ten products for the summer. This timely article was very popular with their audience with an organic reach of 26,203, 1,057 post clicks and 124 reactions, comments and shares. 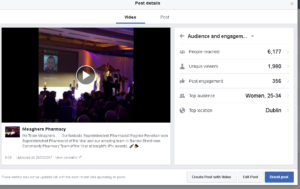 When Superintendent Pharmacist Eugene Renehan won Superintendent Pharmacist of the Year, Meaghers broadcast the awards ceremony live on their Facebook page. This was a super opportunity to share this wonderful moment with their fans. 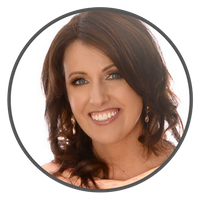 During the show Charlene shared a story about having one of her live Facebook broadcasts attacked by trolls and how upsetting that experience was. She gave some valuable advice on what to do to safeguard against this happening again. Gillian told me about the inspirational #Wrap4Homeless Christmas charity campaign that raised over €26000 in December 2017. Meaghers teamed with the Peter McVerry Trust and charged customers a fee for wrapping their Christmas gifts. This fee was in turn donated to the trust. Gillian explained how social media played a major role in raising awareness about this worthy cause.